Earn 332 loyalty points when you order this item. The Custom Design Milan Reference 10 Hi-Fi 2 has been introduced by Custom Design as a result of their customer's feedback and suggestions. As consumer's perceptions of Hi-Fi furniture are changing, it has become clear that design has come to the forefront of their desires; they want contemporary design rather than something that is simply an accessory, and this has, in some circumstances, become more important than performance. Consequently the New Milan Reference 10 Hi-Fi 2 has been designed primarily as a piece of furniture, but it is secretly a special piece of acoustically enhanced furniture which references Custom Design's 24 years of experience and knowledge to bring the highest standards of audio enhancement to a piece of stunning craftsmanship, which will compliment any household's decoration. The Milan Reference 10 Hi-Fi Furniture Range are manufactured from Solid Oak, Walnut and Ash hardwoods. 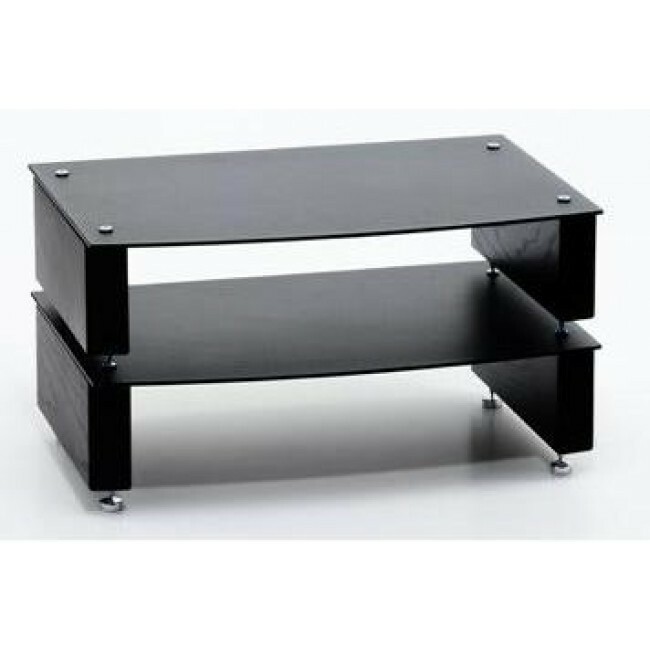 The 10mm glass shelves are manufactured to EN 12105-02, toughened with polished edges and available in Clear or Black finish. The hardwood and glass shelves can support 50kg per shelf and a discrete radius front edge provides the Milan Reference 10 Hi-Fi Range with another distinctive design feature.